Ellen DeGeneres, who is in Minneapolis to promote her move to 4 p.m. on WCCO-TV this fall, surprised everybody when she and her lovely wife Portia stopped by Target Field yesterday. 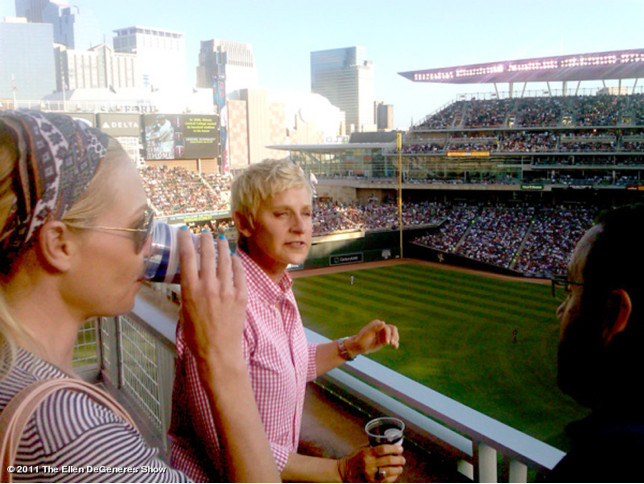 She enthusiastically tweeted to her Minnesota fans, asking: "Where should I go? What should I do?" One tweeter suggested she visits the Mary Tyler Moore statue which she did, with Mayor RT Rybak and a ton of enthusiastic fans.